Welcome to this 156th issue of my monthly newsletter. About 24 months of past issues are available at this web site. Just click on the “Newsletter Archive” link on the left of the screen. The articles tend to be “timeless,” so read or reread some of them at your leisure. If you read my October, 2011 newsletter, you probably remember my call for cancer survivors willing to share their stories by phone or e-mail. Well, I got a nice response. I’ve arranged 49 of the folks who responded into a spreadsheet with their phone numbers and e-mail addresses. It shows the type of cancer they had, if they told me. It also shows the protocol they used to get well and the date when they felt they were healed. Because of some technical issues with the format, I haven’t been able to figure out a way to put this on my website so you could access it. I’m just going to have to send it to each of you who request it. It will be attached to an e-mail. So, if you would like to see it, send me an e-mail at uhealcancer@gmail.com and tell me whether you prefer a Microsoft WORD format or a Microsoft WORKS spreadsheet? Please put “Winners Roster” in the Subject line so I’ll know to respond immediately. One caution. I don’t khow the location of the people on this list, except for three who are outside the U.S. and Canada. So, if you want to call one of these people, please be sure to look up their Area Code on Google to determine their time zone before you call them. There is nothing more annoying than getting a phone call from someone at 6 AM or 11 PM because they neglected to realize that your time is not the same as their time. Anyway, if you want a copy, just send me an e-mail and I’ll send the list back to you. I am an avid reader of your newsletter. You will probably not remember me but we talked over the phone a year ago because my partner was diagnosed with stage 3 ovarian cancer. By the way, she has been now in remission for 11 months and I think it is due to the Budwig diet that she is following after I read about it in your book. So, a big THANK YOU. I would like to comment on the newsletter from September when you mentioned the Budwig center in Spain. I am very surprised about this center. Although I am sure they have great results, they provide the patients with a lot of drugs (I call drugs any medications they gaie, even natural substances like homeopathy). I read all the books from Dr Budwig that have been translated in English (3 books) and she is against any drugs. My partner went on a ‘cure’ for 5 weeks to the center where you eat the Budwig diet, do some detox (like coffee enemas which is already a little bit beyond Budwig protocol) and you do some stress management (which is completely in line with Budwig protocol). I am surprised that you don’t mention that center in your newsletter because this center is the ‘legal’ one to do the Budwig. I don’t know anything about the other center and it could be doing a great job since everything they do seems great but I have never seen anything mentioned about it in the Budwig books. I just thought you would like to know this in case you don’t know the center. I have nothing to do with the center, just that my parnter went there and that I have read about it in Budwig’s book. Keep up with your newsletters. I love them. Thanks, Jackie. Well, just two comments. I like Lothar Hirneise’s book but was unaware that he had founded a cancer treatment clinic in Germany. Also, I have talked to Dr. Jenkins, who runs the Budwig Center in Malaga, Spain. He spent some time (not 10 years) with Dr. Budwig and he told me she approved his use of her name on their clinic. I don’t agree with Jackie that homeopathy is “drugs” in any sense, but we’re all entitled to our opinions. So, you now have another clinic option. Just take a look at the website Jackie gave us and contact them, if you feel you need their help. As those of you know who have talked to me on the phone as part of my coaching service, I always stress attitude as an essential part of healing. Here is a presentation by Marcus Freudenmann, the gentleman who traveled with his wife and four kids all over the world for 2 1/2 years visiting 105 natural cancer healers. 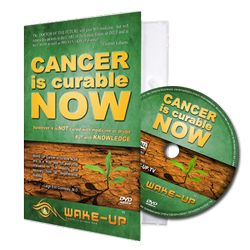 The result was a great DVD called “Cancer Is Curable Now.” I admire Marcus, who has probably studied natural cancer healing in more environments than anyone else on the globe. Then, get a copy of his book (download e-book or paperback available at the website)and read it. I have no financial interest in it at all. It is just one of the most remarkable tales of cancer healing I’ve read — and I’ve read a lot of them. Are you procrastinating about getting your jaw cleaned up of root canal-filled teeth and cavitation sites? Well, you certainly need to watch these two videos. They very graphically show you the problem caused by root canal-filled teeth and other dental toxin problems. I appreciate Lorenzo Acerra sending me these two videos from Italy. They have sub-titles in Italian but the audio is in English. In fact, in the second video, the gentleman talking in the last couple of minutes of the video is Dr. Stuart Nunnally of Marble Falls, Texas. He is the wonderful dentist who cleaned up my jaw in July, 2010. I consider him one of the top two dentists in the U.S. (or the world!). Here are the videos. Please watch ’em. It takes less than 14 minutes. Most of you know that monosodium glutamate (MSG) is quite a harmful additive to most processed food. It is a neurotoxin that is used to enhance the flavor of processed food and make it cheaper to produce. You need only 8 chickens to make the chicken soup taste good when you use MSG instead of the 20 you need when you don’t. Since 1947, this has been the most widely used additive in all processed food. It actually anesthetizes portions of the taste buds in your mouth to exaggerate certain tastes. For about 30% of the population, MSG causes a very uncomfortable reaction — dizziness, headaches, upset stomach, flushing, heart palpitations, etc., etc. The neurotoxins it produces can actually affect the brain permanently in some people. My late wife used to pass out occasionally from eating MSG when we were unaware that the restaurant food had it in the ingredients. Of course, in restaurants, it is hard to tell what dishes have MSG in them. The restaurants (particularly Oriental restaurants) frequently advertise on the menu “No MSG.” Well, what my wife and I found was that the restaurant doesn’t add it, but it is frequently in the powders they buy in bulk to make their sauces, unknown to the restaurant owners. Plus, of course, Natural Flavors. Cindy attached a long letter describing her very positive experience. I don’t have room to quote it here. “Today I had an Emotion Code session with Brenda Lainof. I had already read the book twice and was familiar with the material and the concept, but Brenda’s work really showed me how The Emotion Code can help. It was so much more powerful and meaningful in an actual session than in a book. She helped me start muscle testing, which I had not been able to successfully do before. Very quickly we zeroed in on two important ‘stuck’ emotions that were contributing to my illness and Brenda released them. Afterward I felt a great sense of peace and quietness, but I knew that was all I could handle for one day and I had to rest. Brenda’s caring attitude and her enthusiasm for her work came through and helped me feel calm and hopeful. She has a wonderful energy about her. Thank you so much, Brenda, for your generous offer to help. And thank you, Bill, for telling me about Brenda.